Whaler’s Cove, an upscale, adult oriented condominium resort on the Island of Kauai. We are often asked for an adult’s only resort in Hawaii. Actually there are none that are exclusive to adults, but Whaler’s Cove comes very close! Whaler’s Cove is located on the sunniest shore of Kauai on Poipu Bay in a quiet residential area with little traffic. This is the perfect choice if you are looking for privacy and to get away from it all. 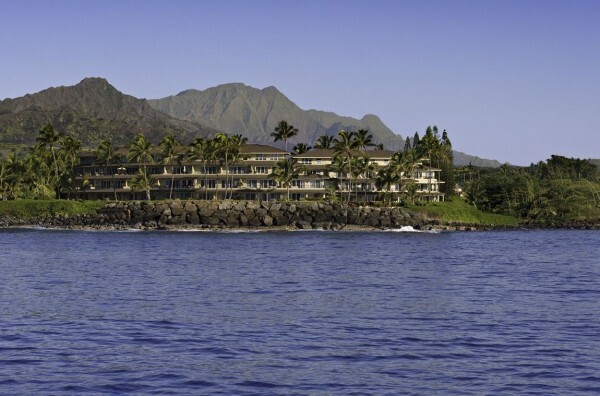 Whaler’s Cove has won many awards for most Romantic Hotels in Hawaii! While Whaler’s Cove is a condominium property, it does still have many of the amenities offered in full service hotels. Full maid service, and oceanfront pool, and hot tub, along with many amenities hotels do not offer. There are only 38 units, all of which have either one or two bedroom. The two bedroom units have 2 bathrooms, which makes this a perfect fit for 2 couples. Each unit also has a full kitchen, a washer and dryer, cable TV and, for those who just can’t leave everything behind, Wi-Fi! Oh and did I mention a spectacular oceanview from each unit? If you prefer to not cook every meal, and who wants that on their vacation, there are many great dining options: The Beach House, Joe’s on the Green, and Roy’s at Poipu, to name a few. The Island of Kauai, Hawaii’s Garden Isle is the home of Mount Waialeale, which means overflowing water. The summit of Mount Waialeale is one of the wettest spots on Earth, averaging over 400 inches of rain per year. (And you though the Pacific NW had lots of rain!!). All of this rainfall yields lots of waterfalls, a beautiful rainforest and amazing flora and fauna! Don’t worry, though, the rain that falls at Mount Waialeale, does not generally affect the coastal parts of the island, particularly Poipu.